Mudgeera ba is a suburb on the Gold Coast. We love the essential character that remains one of the nineteenth-century village. Mudgeeraba has the characteristics of a rural hinterland for the Gold Coast. It was originally a farming, timber getting and cattle grazing centre in the mid 1870s. 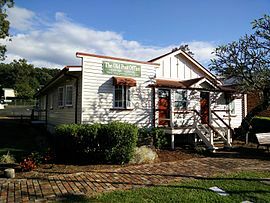 There are many heritage listing building in Mudgeeraba including the picture of the old post office on the left! We work with many varying industries and have a passion for growing small business. You can be assured that your work in completed to the highest of standards as we are a member of the Australian Bookkeeping Network. Why choose Astute Administration Services for Bookkeeping Mudgeeraba? Here at Astute Administration Services, no job is too big or too small for us when it comes to Mudgeeraba Bookkeeping. A professional service – we do what we say we’ll do, when we’re going to do it. We are Gold Coast locations specialists so will come out to Mudgeeraba at a time that suits you.